Climbing from the lush fields of the Low Weald to the astonishing landscape of Ashdown Forest – a former hunting ground – with vast, high expanses of heather and heathland, this walk takes in the landscape that inspired Winnie-the-Pooh, sweeping views and rich woodland. 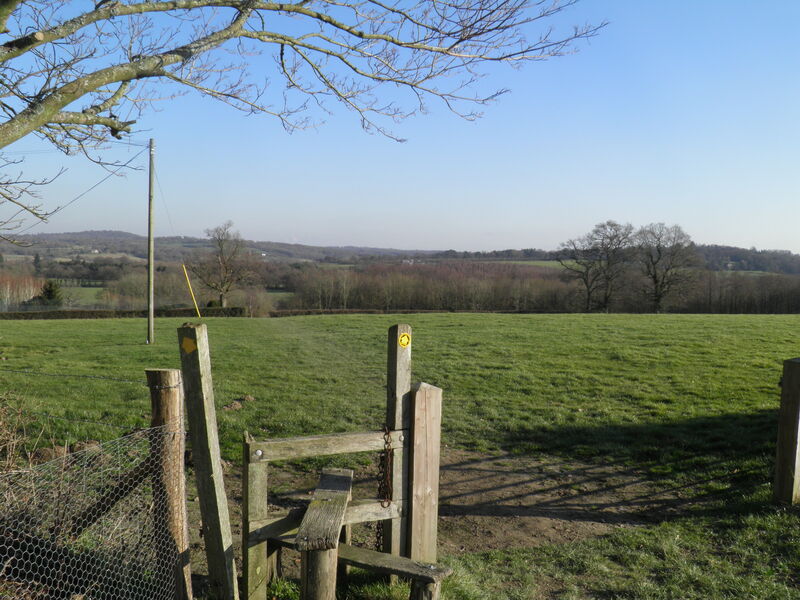 Underfoot: The Low Weald is renowned for its clay soils, so sections of the first couple of miles of this walk will invariably be muddy underfoot. 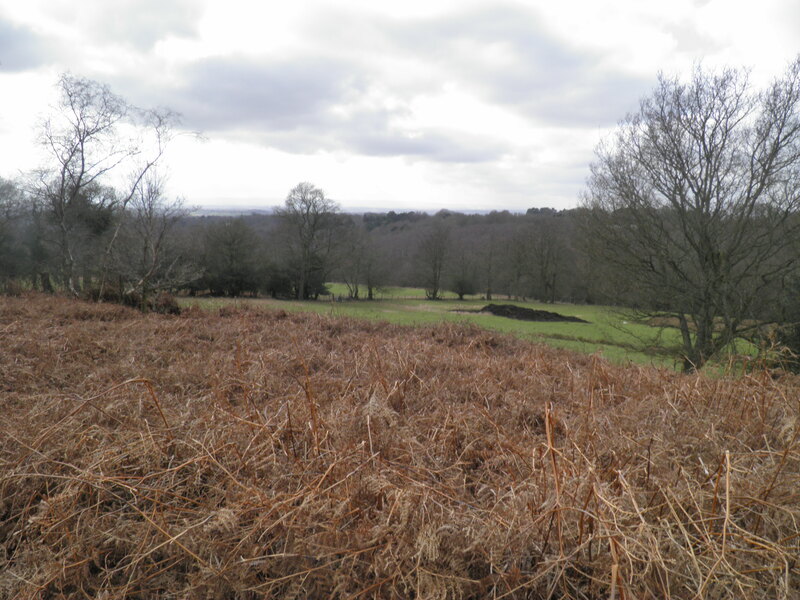 However, once you have climbed to the Ashdown Forest, the sandstone landscape makes for almost guaranteed dry walking. 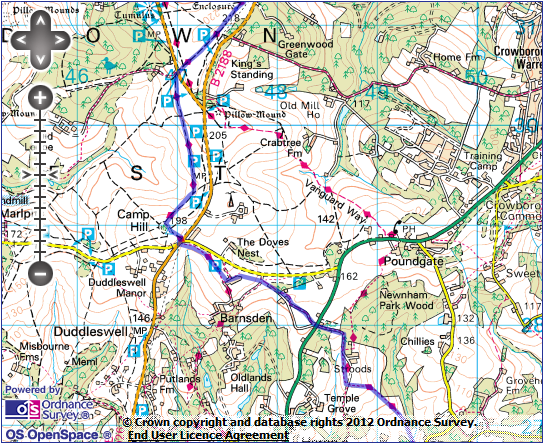 Terrain: From Buxted, the first three miles represent a steady climb, at varying gradients, of about 150m to the heights of Ashdown Forest. This is mirrored by a similar descent for the last few miles. Maps: 1:50,000 Landranger 199 Eastbourne & Hastings and 188 Maidstone & Royal Tunbridge Wells; 1:25,000 Explorer 135 Ashdown Forest. 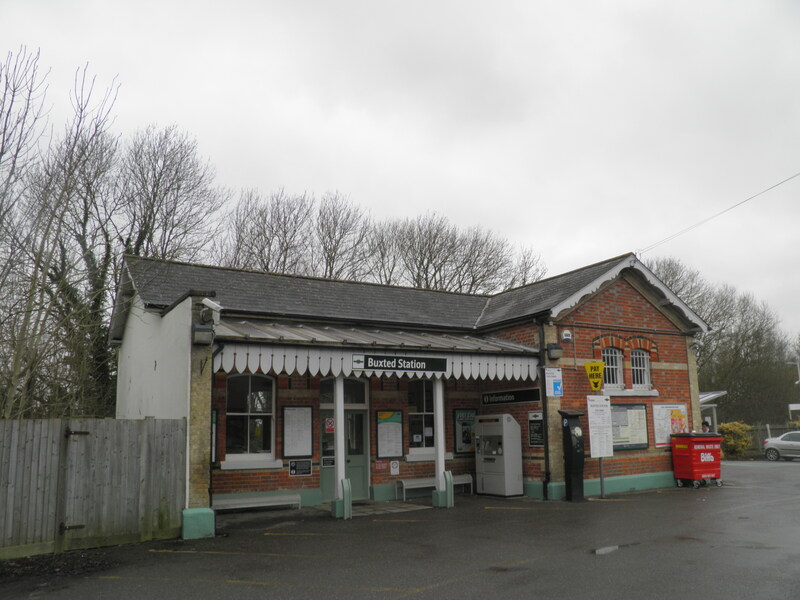 Getting there: Buxted is situated on the long branch line to Uckfield, with hourly Southern services on Monday-Friday from London Bridge (67mins) via East Croydon (52 mins) for connections from London Victoria. On Sundays, there is still an hourly service, but this operates as a shuttle from Oxted (39 mins) where it connects with a train from London Victoria via East Croydon. 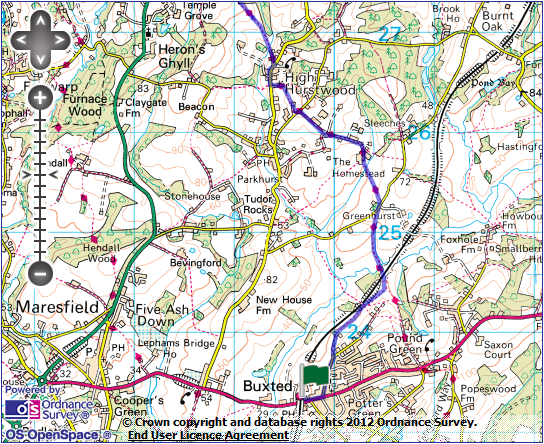 Useful websites: The route includes parts of the Vanguard Way, the Wealdway and the High Weald Landscape Trail. The walk crosses the high Ashdown Forest. The Spa Valley Railway operates steam trains from Eridge to Tunbridge Wells West. Getting home: Monday-Saturday, Eridge is served by an hourly Southern service to London Bridge (58 mins) via East Croydon (41 mins) for connections to London Victoria. On Sundays, an hourly shuttle service operates to Oxted (27 mins), where it connects with a service to London Victoria via East Croydon. Fares: An off-peak return to Buxted for £15.70 (child £7.85, railcard £10.35) will cover both journeys. From Buxted station’s single operational platform, exit into the car park and turn left onto the main road, heading uphill. Just before a zebra crossing, turn left again on Church Road. 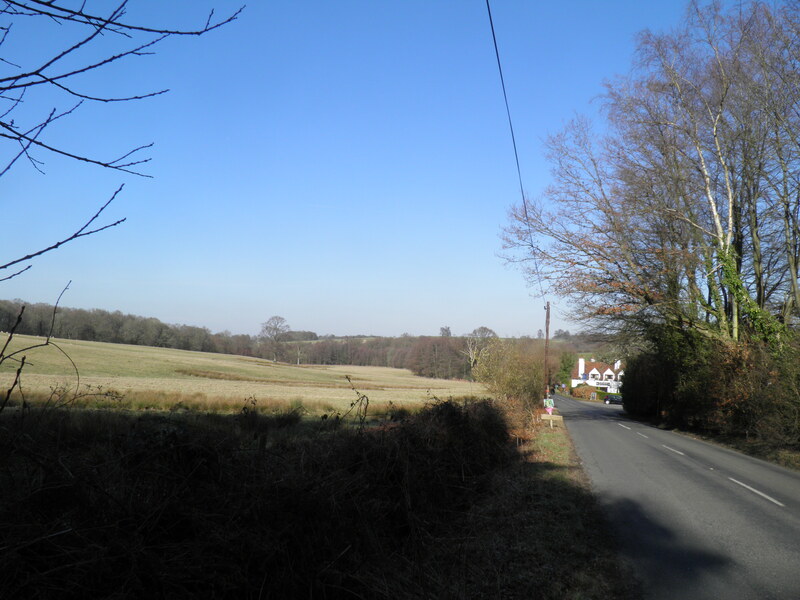 Pass the flint church and after about 400m on this residential road, with views opening up over the Weald, branch left on a track (footpath waymark on the telegraph pole). Coming to farm buildings, pass through a gate to the right of the ramshackle barn and keep straight ahead in the large field beyond, paralleling the railway line. On reaching the far lefthand corner, do not cross the railway bridge, but keep straight ahead on a short section of fenced path and into a second field, again keeping beside the railway cutting. through the trees to the left – this is very easily missed! Follow this path under a railway bridge. Keep straight ahead through this short stretch of muddy wood to a footbridge over the River Uck, then follow the path up the right hand side of the field ahead, climbing past a pill box sheltering under a lone tree. Over a stile, you soon reach little Fowly Lane. 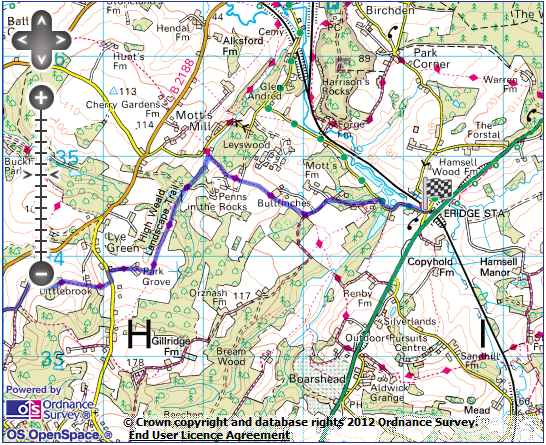 Turn right for around 50m past a pond; just after thr turning to Greenhurst Farm, pass left over a stile beside a gate. Drop diagonally across the field to the far righthand corner, the houses of High Hurstwood scattered on the hillside opposite. 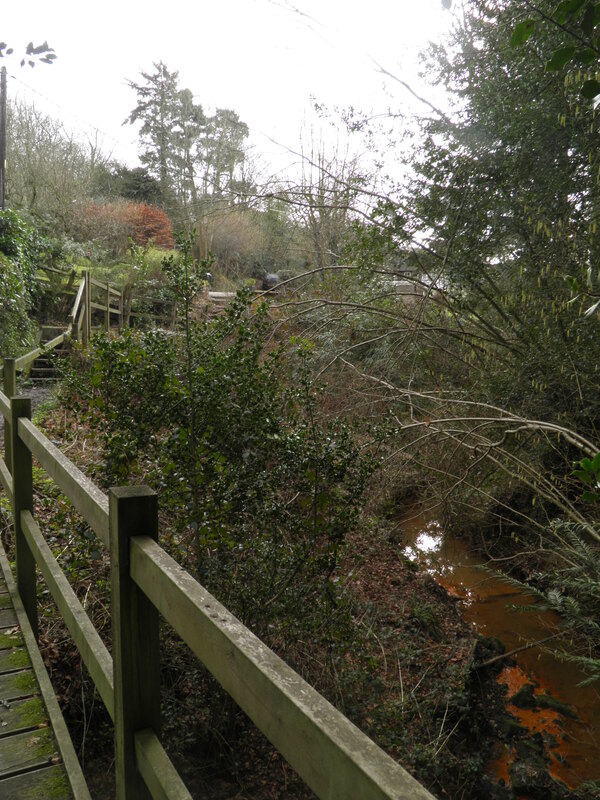 Over a stile, follow the stream to a footgate on the left, which leads over the stream to join Holders Farm’s drive. Keep straight ahead on this track, passing scattered houses. At a track junction by a postbox, veer right on a concrete track (following bridleway sign). Past Mount Pleasant Farm, this becomes a sandy path, leading to small road. road and crossing a driveway. At a path junction, turn right and follow the clear path as it twists between gardens and woodlands. The path emerges in a field in front of High Hurstwood’s remarkable Holy Trinity Church. 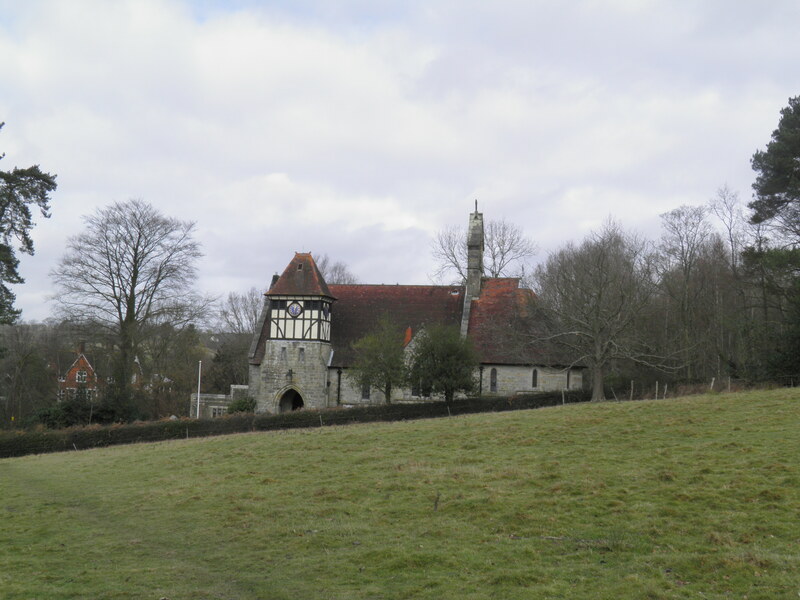 High Hurstwood’s church, dating from the 1870s, is a highly unusual design, with its half-timbered clock tower built on top of the porch, almost like a dovecote, and with a circular apse. 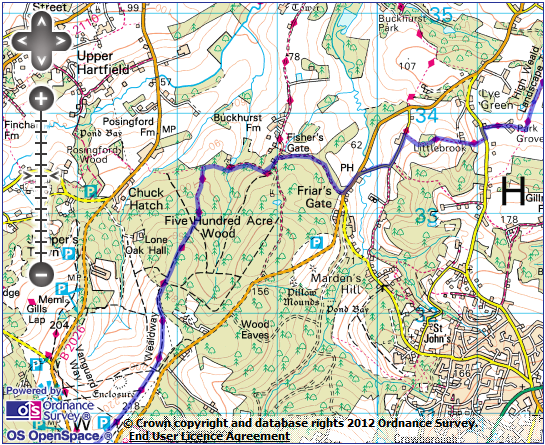 Turn left down the church’s access road and then right on Chillies Lane, through High Hurstwood. Just after a corner, veer left downhill on a track (following a Vanguard Way (VGW) waymark). By the second whitewashed house, keep left to cross a footbridge over the stream, here discoloured by iron deposits. From here a lovely – though occasionally muddy – gorse-lined path cuts uphill between sheep-shorn fields. Halfway up the hill, follow waymarks onto a clear path cutting across the field towards the line of trees at the top of the rise. From here, you begin to enjoy fine views south towards the faint line of the South Downs on the horizon. The waymarked path cuts across the hilltop, in front of the fine Sussex-colonial Stroods House. At a path junction at the bottom of a small flight of steps, following VGW right. On reaching Stroods’ concrete track by a pond, turn L along the drive, leaving the VGW. The drive leads through the woods to the busy A26. Cross with care and take the entrance to Barnsgate Manor opposite, keeping to the righthand drive. Past fields of llamas, you approach the complex of buildings at Barnsgate Manor, perched on the hillside with fine views across Weald, now a group of of cafes and restaurants. 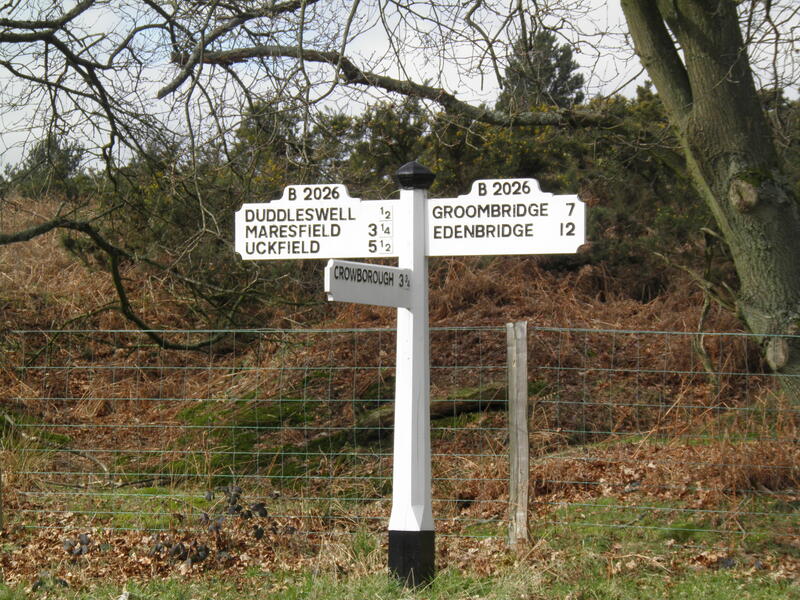 Past the small vineyard, turn right in front of the Wine Shop and through a gate ahead (with a bridleway waymark) into the commonland of Ashdown Forest. 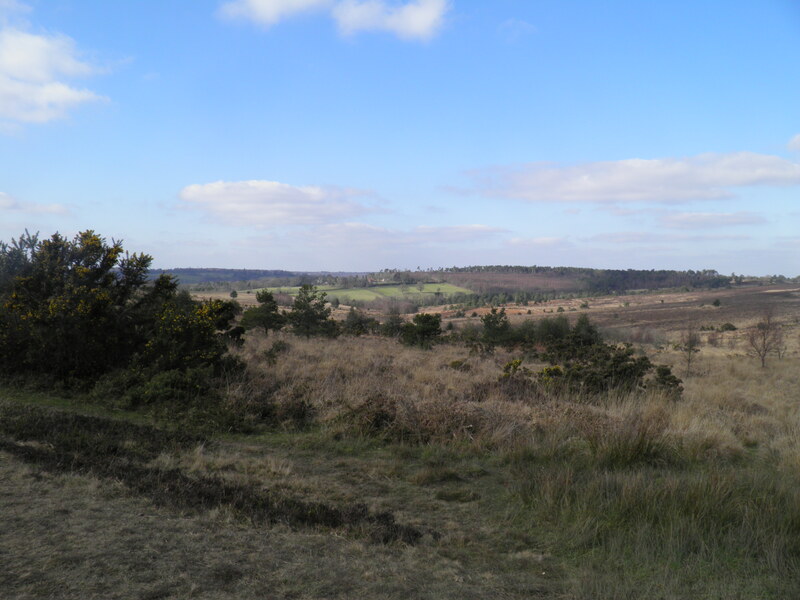 The Ashdown Forest is a hunting forest dating back to a little after the Norman conquest – ‘forest’ in this sense did not necessarily imply trees, but a hunting reserve – amongst other royalty and nobility, Henry VIII is known to have hunted here. 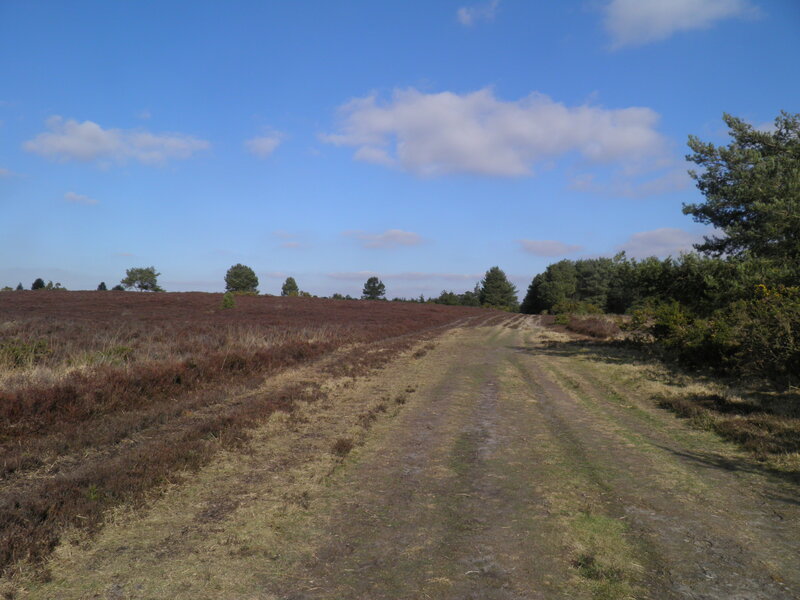 The Ashdown Forest, which rises up to 223m contains a wide range of landscapes, including woodland, and high heather commons. From the 13th century onwards, a 23-mile long fence, or pale, was built around the Forest, though the rights of commoners to graze and collect firewood was retained. 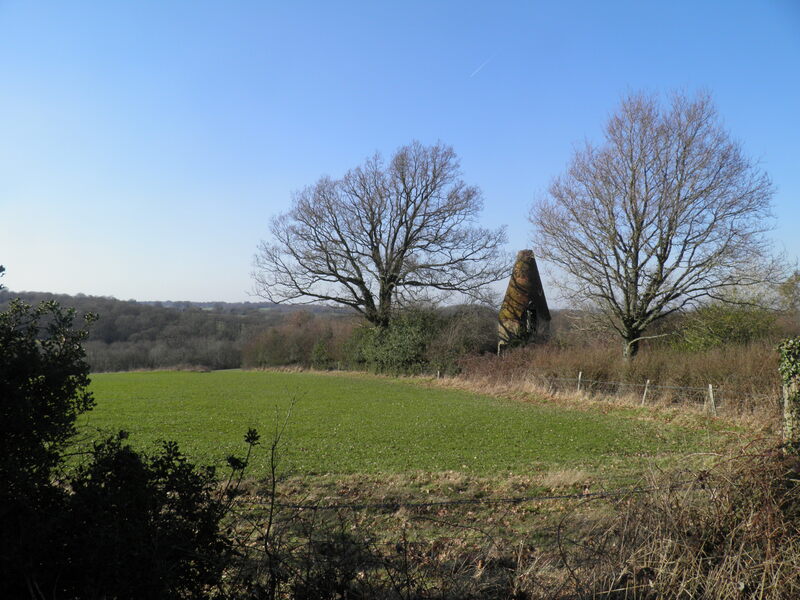 Surprising as it may seem today, the Forest also had a major role in British industrial history, with the first blast furnace in the country opening at Newbridge in 1492, using the rich iron deposits in the area. If the landscape looks familiar, it may be a memory of E.H.Shephard’s illustrations of Winnie-the-Pooh, based on this landscape. The author, A.A.Milne, lived nearby and took his son Christopher Robin walking in the forest. You may well encounter deer, but bears, tigers and kangaroos are a little scarcer. Follow the track through scrubby woodland. At a set of signposts, keep straight ahead over a little road to follow a faint path ahead alongside the hedge, paralleling the busy road. Continue past farm buildings behind the hedge to a waymark post. Keep straight ahead on a track and at the corner by a pebble-dashed house turn right on a path (marked by a well-hidden Wealdway (WW) post). This clear path leads out onto the springy, scented heathland. Where you come alongside road, follow the WW sign left over an over-sized footbridge and stile into a field. Keep alongside the hedge. Just after passing a cottage, cross the stile to reach a road junction. Cross this busy junction with care and pass though the footgate beside the ‘Turning Area Only’ sign. Keep straight ahead to the round clump of scots pines by the trig point on top of Camp Hill. From here, there are stunning views across the Ashdown Forest and to the South Downs, the songs of skylarks often echoing across the open landscape. Walk around the clump to the right to locate the ‘Camp Hill Clump’ sign and take the broad, rutted path dropping gently to the right from here. The path runs a little below the road, providing a stunning walk across the hillside. Eventually you will reach a gate, passing through it to a small car parking area by the B2026. Cross the road and take the path opposite through the gorse (WW marker). Keep straight ahead on this path through the heather and scattered woods. Descending from circular Greenwood Gate Clump, views open up towards the North Downs escarpment. 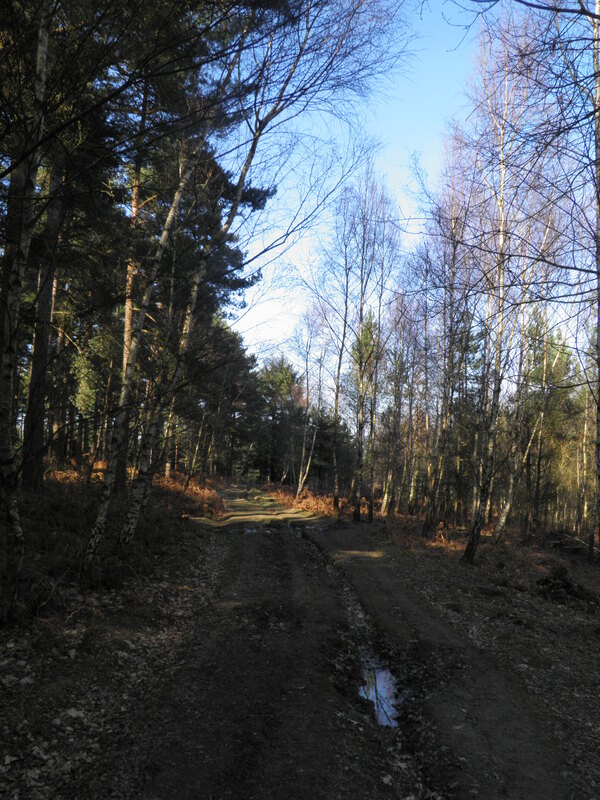 Keep straight ahead downhill and on reaching the edge of silver birch woods, turn left on the track alongside them, passing horse training areas. Follow the track as it swings right to continue downhill, eventually regaining the WW waymark posts. Continue to follow these as the path becomes less clear through the woods. the denser Five Hundred Acre Wood. Follow the WW waymarks on tracks through wood to arrive at a track junction at the edge of the trees. The Five Hundred Acre wood is, of course, the Hundred Acre Wood in Winnie-the-Pooh. It is a fine mix of beech, silver birch, holly and sweet chestnut. 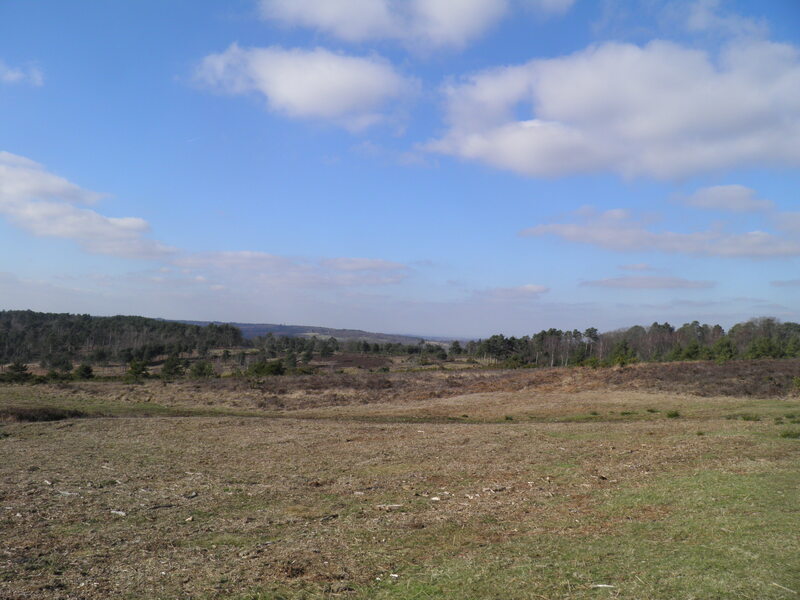 It is part of the majority of Ashdown Forest which was sold into private hands at the end of the seventeenth century. Here turn right. The track drops to Kovacs Lodge and joins its tarmac drive. This climbs steadily, and at the top keep left. Pass a cottage and keep straight ahead on the drive along woodland edge, with lovely views north across the lush fields of the Weald. road for around 200m. Just before the lovely Half Moon Inn, take minor Whitehouse Lane to the right. Follow the road over a babbling stream and out of the valley. Just past Whitehouse Farm, turn right at a footpath sign. This runs along the righthand edge of a field and then cuts through Legg Wood, following a waymark to the left just after a footbridge. One more field beyond the wood leads to pretty Littlebrook house in a small valley, from where you follow waymarks straight ahead, climbing steeply to a road. Follow the High Weald Lanscape Trail (HWLT) signs to take the road left for 50m then right at a lodge house on Park House’s drive. Follow the waymarks through the attractive collection of cottages clustered around Park House and into the field beyond. At a kissing gate, follow the waymarks left along the field edge, descending gently. In the next field keep straight ahead to the edge of the woods, passing an outcrop of large boulders. 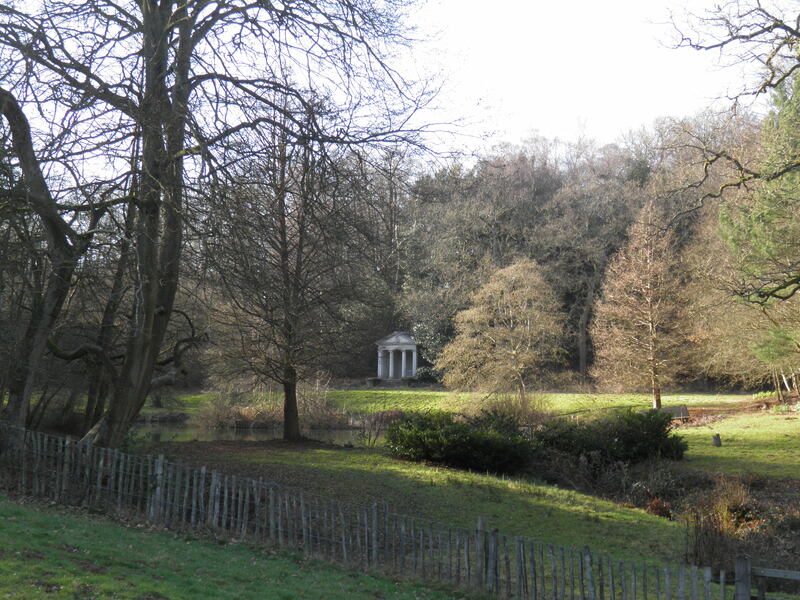 Descend through the trees and an open field, passing a lake with ornamental temple on the left. Follow the waymarks across Penns-in-the-Rocks’ drive and onwards down the small valley. 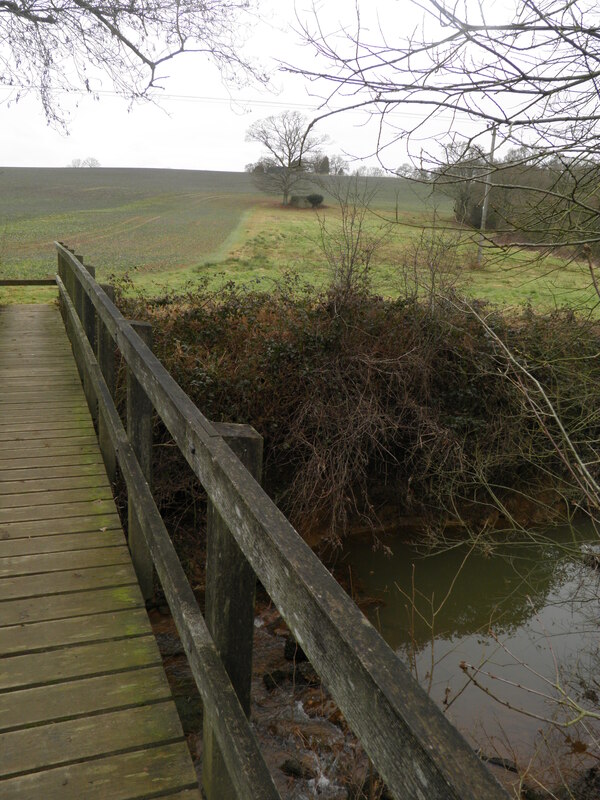 A second footbridge recrosses the stream into an attractive, if marshy, meadow. At the edge of wood ahead, turn right alongside the fence, climbing out of the valley. From the top, next to Rocks Farm, waymarks lead you across a number of small hilltop fields towards the oast house at Bullfinches. From Bullfinches, the path descends through 2 more fields to a footbridge and a track. join a minor road in the pretty valley. Follow this right passing ponds and oast houses. At the end, turn left to immediately reach Eridge station, shared between Southern and the preserved Spa Valley Railway. If you have a while to wait for the hourly train home, the Huntsman Inn is a little beyond the station. 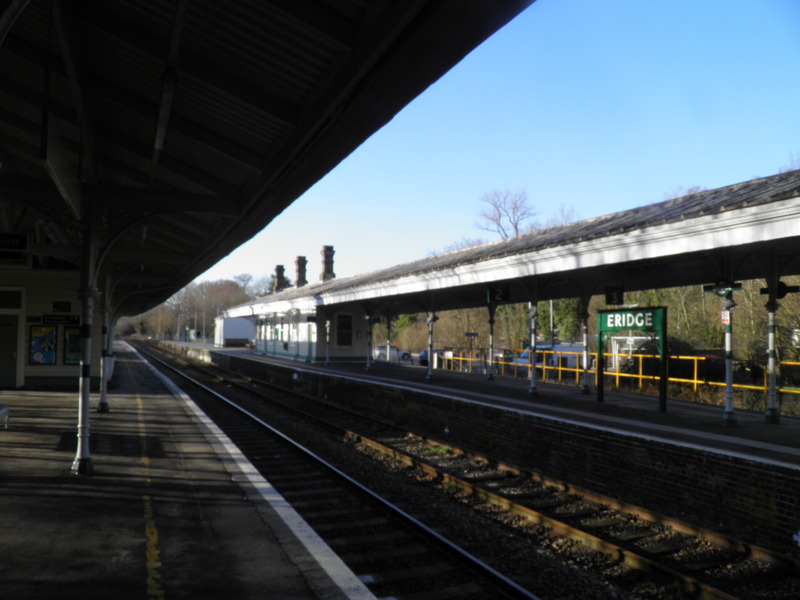 Eridge station – smartly restored – is a shadow of its former busy self, with routes branching off to Tunbridge Wells, East Grinstead and to Heathfield. The remaining line to Uckfield was formerly a through route from London to Lewes, but was severed in 1969. The line to Tunbridge Wells remained open until 1983, being subsequently re-opened by the Spa Valley Railway heritage outfit, with services returning to Eridge in 2011. Eridge station serves the distant hamlet of Eridge Green and little else – when it opened, even that did not exist, and the station took it’s name from the stately home at Eridge Park, 2 miles to the north east.